What happens on the day I move out? Set your alarm folks and dig out the rubber gloves! Our independent inventory company will come to your property any time from 7am on the last day of your tenancy to conduct a check-out. Please make sure the property is returned to the same condition as the inventory and completely clean and clear of all personal belongings or rubbish, including outside areas, by 7am. No matter how useful you might think an item will be for the next tenant, it’s important to not leave it, otherwise you may be charged for its removal. We recommend moving out the day before to avoid any last minute stress! If you are still in the property on your check-out day and the inventory company are not able to conduct your check-out, you will incur a re-visit fee from the inventory company and an additional charge of £60 for us to rearrange your check-out. You will also be liable for rent until the property can be formally checked out by the inventory company. No, you do not need to be at the property for your check-out. If you are present you will be asked to wait outside while our independent inventory company compiles the report. This is for two reasons; firstly because they want to be able to complete the report independently without distraction and need peace and quiet in order to record it, and secondly to make sure there is no bias affecting the report. The same rules apply to your landlord, so we feel like it’s pretty fair. What shall I do with my keys when I move out? All keys should be left together inside the property. If you’ve got a favourite keyring you just can’t be without, don’t forget to remove it! Please do not hand-deliver or post keys back to our office, as this will mean they are not listed on the check-out report and you may be charged. If you have a bedroom door key, please leave the bedroom door open, with the key in the lock. If your front door requires a key to lock when closed, please pop the rest of the keys inside, lock the front door and push the last set through the letterbox. Voila! What do I do with my bills when I move out? If you are on a bills-included package you don’t need to do anything! Otherwise, on the last day of your tenancy, contact your gas, electricity and water suppliers to let them know you are moving out and to give them your final meter readings. (Tip: take photos of all the readings, rather than jotting them onto a piece of scrap paper that might end up in the wash!). If you have top-up meters for any utilities, you must ensure these have the same amount of credit as when you moved in. You can find this information on your inventory. If we have to top up payment meters, charges will be incurred. Don’t forget about broadband / telephone providers, your TV license and to re-direct any post. We will not be able to collect any post for you once you have moved out. How do we avoid deductions from our deposit? The best way is to use your inventory and go around the house room by room making sure the property is returned to the same condition as when you moved in. Don’t worry, we will of course allow for fair wear and tear. 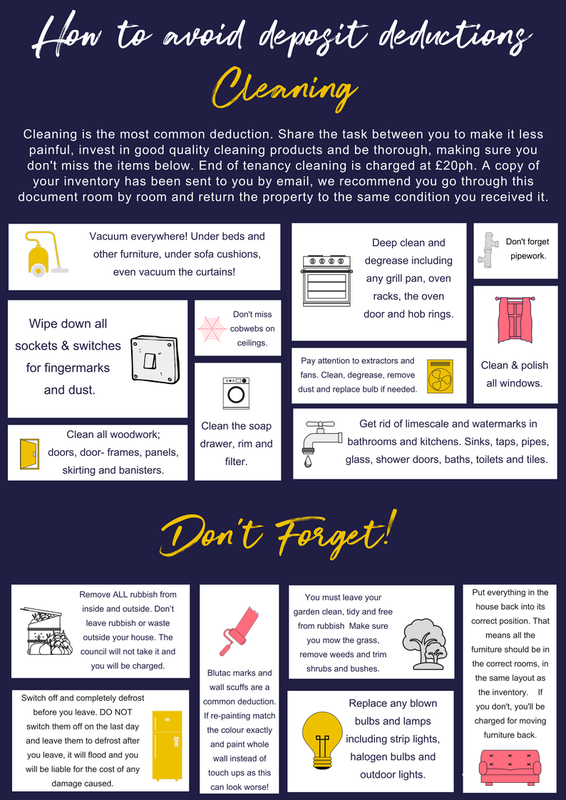 Use our guide below to make sure you don’t miss any of the most common deductions people forget. After the check out has been completed on the last day of your tenancy, we aim to have a breakdown of any deductions to you within one month. Once this has been agreed, your deposit will be returned within 48 hours to your nominated bank account. We know you probably have a lot more questions, click here to find out more about how the deposit return process works.